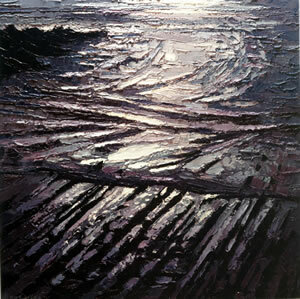 Alan drawing at Hartland in North DevonMeeting landscape artist Alan Cotton is an uplifting experience. Like one of his sweeping oil landscapes, he brings a smile to the face as he muses again and again on how lucky he has been in his life; years filled with love and loyalty, family and friends, and (although he would never use the superlative himself) spectacular career success. From being a boy so poor that his mother made his paintbrushes out of her own hair, to accompanying the Prince of Wales five years ago on a tour of Sri Lanka, Australia, New Zealand and Fiji as his official artist, Alan has reached the point where, not only do his paintings fly off the wall at his exhibitions, they fly off the wall before they are even hung at his exhibitions. This is, of course, largely due to the power of the Internet, something which has made a huge difference to Alan (and other artists) over the past few years. Many paintings shown in an exhibition catalogue are now sold before the show even opens. In the past, nothing was sold before an exhibition's private view, but the Internet has changed all that, and now selling from the catalogue has become the norm. 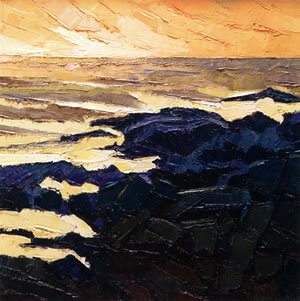 "It seems extraordinary to me that people will often buy one of my paintings without actually seeing the canvas for themselves first," he says, as he shows me around Brockhill Studio, the home-come-studio that he designed and built himself at Colaton Raleigh in East Devon, where he lives with Pat, his wife of nearly 50 years and mother of his four children. "But I suppose somebody who buys like that will have already seen my work 'in the flesh', as it were, so they know what they're getting. They are probably adding it to their collection. But it's amazing, when you think about it, isn't it?". Happily for the artist, this now means he can concentrate on enjoying traditional "first night" private views as parties, where he can meet and greet - glass of bubbly in hand - everyone invited, without fretting over how many little red "sold" dots will appear by the side of each painting during the night. 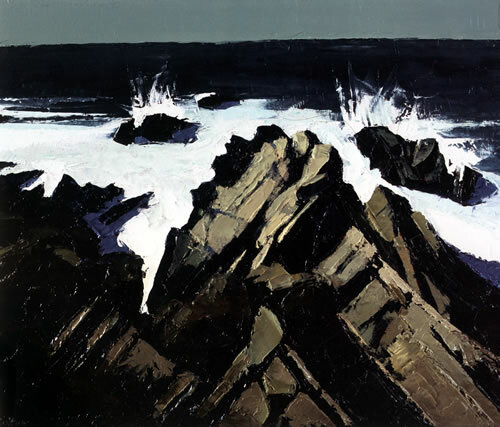 Devon - Hartland, Sea Washed RocksHis current exhibition is, as usual, being shown at Messum's Fine Art Gallery in Cork Street, Mayfair, in London. The 53 oils on canvas (of which more than 30 have already been sold) are all in Alan's signature style of knife paintings - textured layers of paint applied with an artist's knife, which seem to chase across his stunning impasto landscapes. The paintings featured are the results of Alan's frequent travels to France (Provence), Italy (Piemonte), Ireland (around Donegal) and, closer to home, the Hartland peninsula in North Devon. They are all areas he has visited many times, but ones that continually present him with new challenges, as he strives to capture their beauty, colour, vibrancy and spirit. The gallery he is showing at is run by one of his closest friends, London art dealer David Messum. Their friendship was forged in the early 1980s when, having given up his teaching job to concentrate on painting full-time, Alan was having a hard time making ends meet. It was David who stepped in to save the day in a huge show of confidence in Alan's work, offering to pay him an annual salary, set against future sales. Alan recalls the events of 1982 very well. 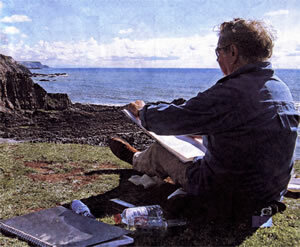 He was working as a senior lecturer in painting and art history at Rolle College, Exmouth. "I just felt I'd had enough," he says. "I rang Pat and ad enough, said, 'Are you coming home at lunch time?' She said yes, she would be. I said, well, I'm going to pop home too. Can I have a discussion with you?" "Pat thought that sounded very ominous. When she came home, I told her I wanted to take her out to dinner that night. That sounded even more ominous. She thought I was having an affair! So we went out that night, and she was quite nervous ... until I told her the reason. I said, look, I'm fed up to death with teaching, I really want to see if I can make it as a painter. But I don't want people to say that I've lived off your earnings..."
By the end of the night, they'd agreed that they would both give up full-time teaching, although Pat would continue part-time while also looking after the business side for Alan. It was the beginning of a tough few years. "It was difficult," he recalls. "We were struggling." One day during this period, Alan was in Cornwall with director David Spires working on a BBC film called An Artist on Every Corner, describing the life and work of the Newlyn school of artists. The crew were filming at an auction, where a major painting by the Newlyn artist Thomas Cooper Gotch was coming up for sale. The man who bought the painting was art dealer David Messum. After the sale, Alan interviewed him for the programme. Halfway through, David suddenly realised who his interviewer was. "What on earth are you doing this lark for?" he asked the struggling artist. Alan showed David some of his recent work and David liked what he saw. Before long, he offered to help support Alan financially while the artist himself concentrated on painting... and so began a life-long friendship and, for Alan, an incredibly prolific outpouring of work, which now sells for up to £20,000 a piece. Alan never forgot David's early help and encouragement, and, when the time came several years later, jumped at the chance to repay his friend's loyalty in kind. It was 1993, and this time it was David who was under financial pressure, which forced him to close his then gallery in St George Street, Mayfair. "I had a call from David, and he said, 'Haven't you heard about my demise? ', I hadn't, although apparently it had been in the previous day's Telegraph. Basically, David's gallery had closed down, as had others in London at that time (it was a time of recession and soaring interest rates) and the banks had withdrawn their support. Sadly, he told me that he wouldn't be able to put on the show I'd been working towards." "I was approached by another gallery owner who said he'd put on my show, but I never thought of leaving David. However, I had all these paintings that were ready for sale. But then I had an idea - or at least, Pat did. We came up with the idea of a weekend exhibition at David's home, Lords Wood, in Marlow." "I put the idea to David, and he said he'd love to, but it would have to be done with proper advertising, a lovely catalogue and everything, and it would cost around £35,000 to do it properly. Well, we're not well off now, but in those days we had even less. I said to Pat, do you think we could raise £35,000 to back our own show? And she said, yes, of course!" And so the painter agreed to stake the dealer, as it were. The Cotton family pledged all their free capital to underwrite the show, and Alan produced 63 paintings, mainly of Provence, but also new work from Tuscany, Cyprus and Venice. Alan and Pat stayed with David and his wife Millie at Lords Wood to prepare the show, carefully hanging all the canvases and arranging the lighting, and helping to receive visitors. The wait on the Saturday morning for the first visitors to arrive was tense. "I had a glass of wine at 10am," says Alan. "Nobody came. At 10.30am, still nobody. Then at 10.40am the first people came... we had a few sales before lunch on Saturday, and then more and more people came... it was fantastic! By Sunday night we were sitting around, feet on the desk, drinking whisky... we'd sold every painting but three." It was a momentous achievement, born out of the loyalty and friendship between the two men. "That altered our relationship, totally and absolutely," says Alan. "I think loyalty is very Important; David and I talk about it a lot. It meant a lot to him, and to us. "It's so strange, because when I was young I used to go down Cork Street and press my nose against the windows of the art galleries and dream that one day my work would be in there. Now my work is in the gallery of a friend and dealer whose business I helped save. It's incredible, the way life can change. I never, ever take anything for granted. I am one of the luckiest guys in the world." Another huge influence has been the writer and art critic John Berger, who, in the early years when Alan was just married, paid a visit to his Wye Valley studio one Sunday morning and found Alan in his pyjamas. The critic had been told about his work by a local doctor, and had come to see for himself. He told the young artist that he had "a real feeling for paint", adding: "I really think the knife is the way for you to go." His next big project, after the current exhibition, is to climb Everest with the explorer David Hempleman-Adams, who has invited him to accompany him next year as expedition artist. "I hope to at least get to base camp," grins Alan. It's all a long way from the days when, in 1966 Alan (who was born in Redditch, Worcestershire) moved with Pat and their two small children to Devon to do an advanced diploma in education. After searching for a home, they eventually found an old farm site in the village of Colaton Raleigh, covered with semi-derelict buildings. Alan took a year off painting to build a home and studio on the site, from scratch - a year he describes as "idyllic". "Friendships that helped make a dream come true"